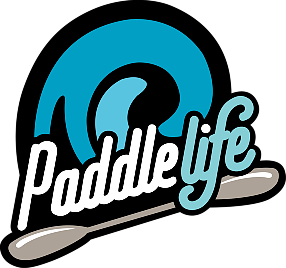 Should you judge a paddler by their boat? 22 Mar Should you judge a paddler by their boat? Or was it a book by it’s cover? Anyway, what does your boat say about you? Well from my experience, not much until you get going! 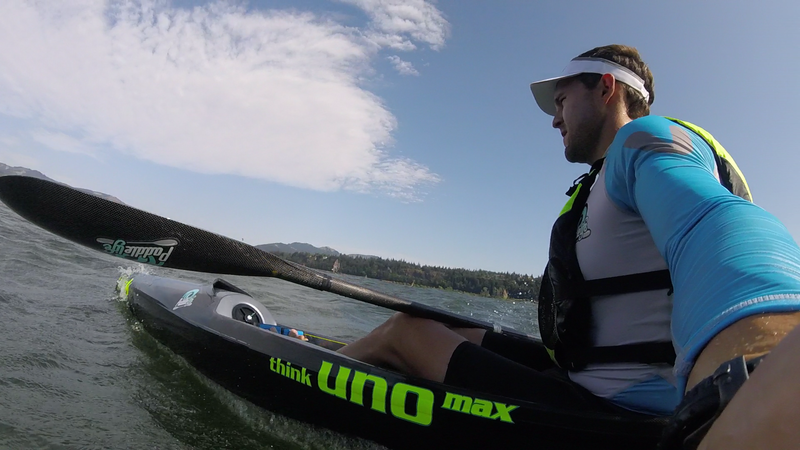 If you line up next to someone in a brand new THINK Gen3 Uno Max (full Elite layup) – they must be fast, right? Well maybe in the looks department, yes, but from my experience, you shouldn’t be so quick to judge! The truth is that the boat doesn’t always make the paddler. We’ve all experienced being unstable or witnessed a buddy battling along in a boat that is just too unstable for them. It’s very little fun and even more painful to watch. You would have heard it from others and now it’s my chance. You may need to look at reconsidering your craft selection if you can’t handle your boat. How does one know if you are categorized as stable or not? It is difficult to say as there will never be a definitive point in your progression, but I can try to identify what it means to be stable. How about this? I’d say that if you feel as though you need to take a brace stroke more than 3 times in a 5km (3mile) stretch of paddling, you may need to rethink your boat selection. This statement is open to objection. Of course, it’s very dependent on the water conditions, but I feel it’s more about being honest with yourself. (I’m not talking relaxed bracing as you surf down a run, think a survival brace or stroke you take just as you feel there might be a possibility you are falling overboard). One small brace, or even 3, might not seem like much, but it can impact on your performance tremendously. Think about taking one stroke, it’s not much until you’re on that pivotal part of a run, gaining momentum, just about to bomb down on the ride of your life. It’s that single stroke – in the split-second between getting onto a great run or falling off the backside of it, when you are most vulnerable, that one brace stroke will happen. You have just killed any chance of the magic happening. You have now flooded the boat, lost speed and are watching it run away. 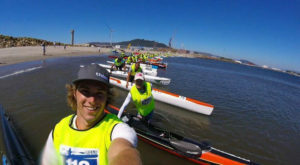 You are also now meters behind your paddling buddy (or competitor) – it’s frustrating. Doing that 3 times in 5km makes a big difference to your performance. The impact of those brace strokes has cancelled out the benefit of having such a fast boat in the first place. Maybe you should have paddled a slightly more stable boat? Let’s take you out of the downwind paddling for now. We are on the lake (or river in my case) doing a normal bunch riding training session. Taking a brace stroke, while sitting on a much needed bunch, could lose you the wave and maybe even the whole bunch. 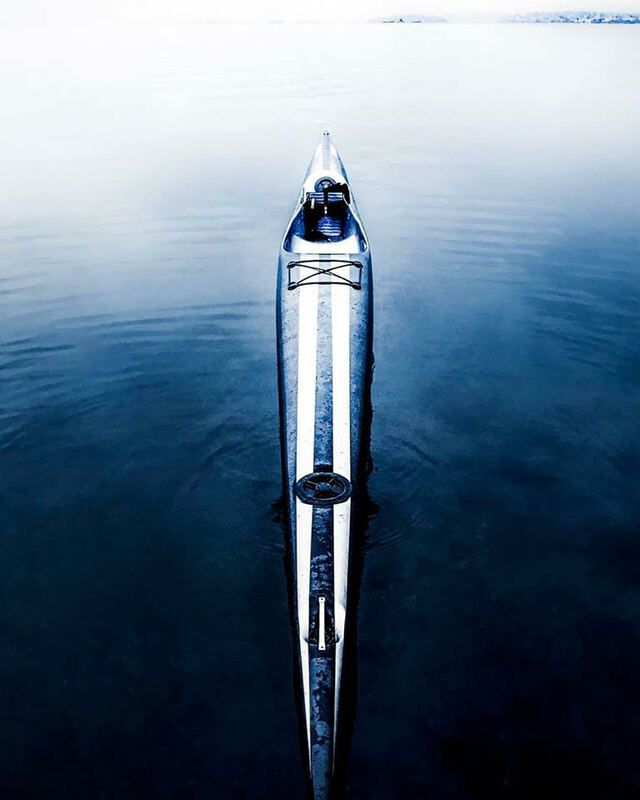 This can mean a lonely paddle home – I have been there done that. My point is that these emergency brace strokes are very rarely for free! Of course, they will keep your hair dry – but there is a cost. So why put yourself in that situation unnecessarily. The top elite-level boats and their designs are fast and they look impressive on the boat rack, but can you really handle it? 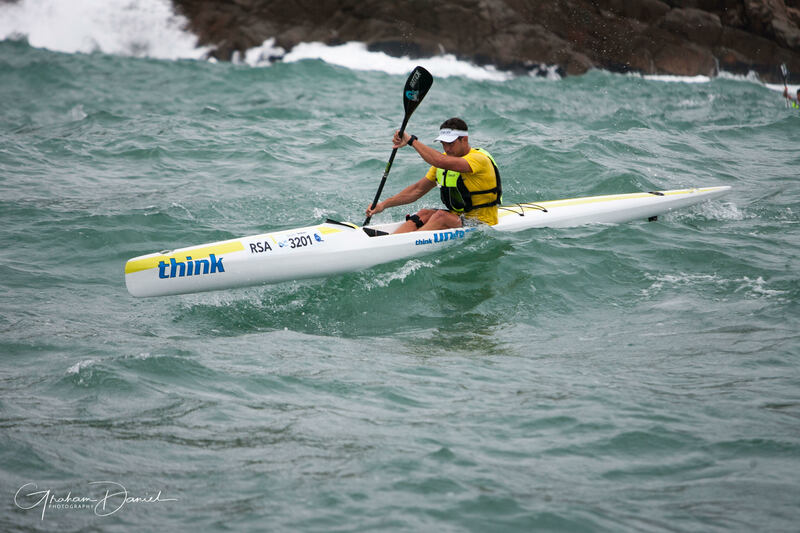 We are so lucky to be surfski paddlers in 2018, we have new technology and innovation at our fingertips, the boats are evolving and our choices are growing. We have manufacturers who are pushing the boundaries for us and our sport. The red tape is gone, we can no longer just categorize a boat as beginner, intermediate or advanced. We have grey area between those categories and it’s an amazing thing. That grey area is filling up with fresh designs, new categories and choice. 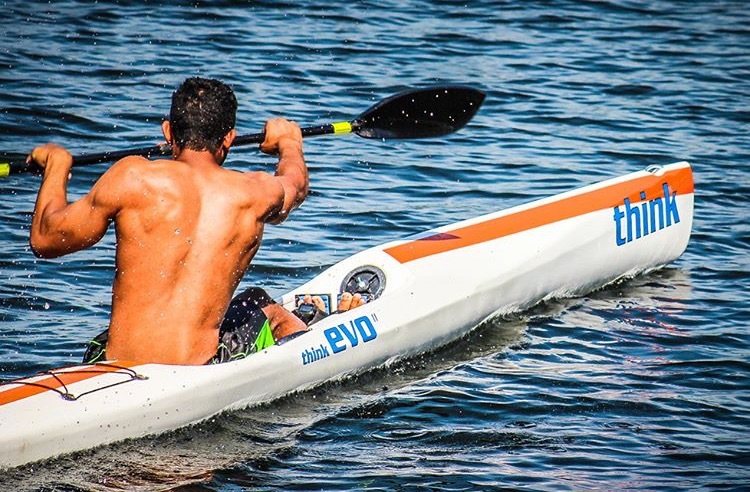 The design of the THINK Evo and Ion has been a game changer for paddlers who wish to boost their performance as a mid-pack paddler. It’s not unusual for paddlers of the Evo or Ion to tell me “Yep, this is for me. I’m at my optimum speed vs. stability situation.”. For the HUKSU coaching athlete, I can see the speeds and distances increasing as confidence builds. The demand for the Evo and Ion has skyrocketed as more people fit into its ‘grey area’ category. The fact that you can have a boat that looks stable from the outside, but paddles like an elite boat is a testament to how far we have come in the design and launch of new boats. I’m not saying that you shouldn’t strive to paddle an ‘elite’ boat. 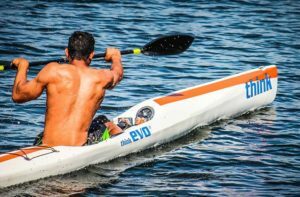 They definitely are the fastest on paper, but just be honest with yourself about what you can achieve in that boat and what you wish to achieve as a paddler. 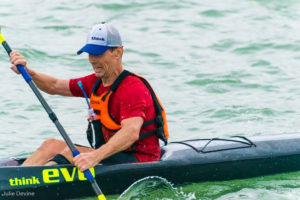 Each paddler will have a unique learning curve, and boy, there is a lot to be learned, but your bad balance and stability is one thing that can hold you back from learning 99% of the other things you should also be trying to get right. If you cannot stay in your boat, a) it could be a safety issue b) there is no point learning about downwind, stroke technique (aka the fun stuff) c) have a look at the other models, you might just be in the wrong one. 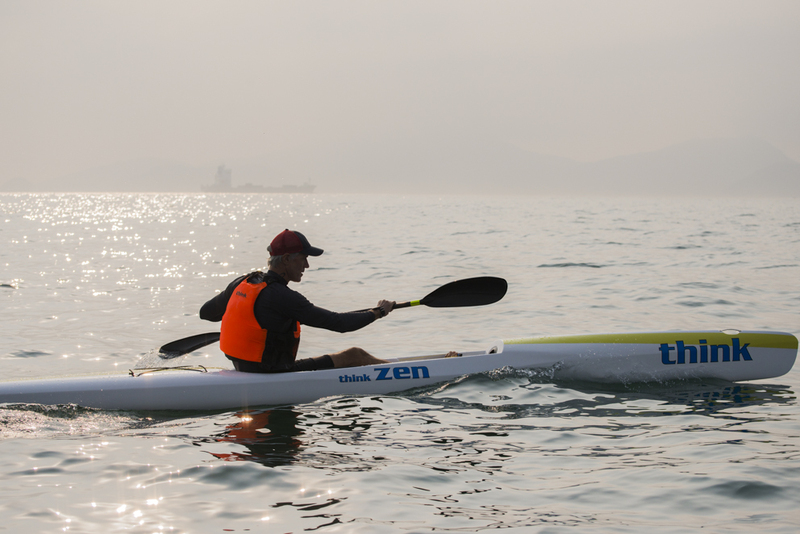 There is so much fun to be had in learning to paddle, so give yourself the chance. I also think, at the end of the day, it doesn’t matter what you paddle, as long as it’s in full carbon! 😉 We don’t need to argue about that.